The pre-battle banquet motif that I have sketched in the other stories on this website is, in my opinion, an exciting ingredient for considering the drama of the Last Supper. As in the other stories, two cosmic forces are preparing to square off with one another, in this case, Jesus and Satan. As in the other stories, theirs will be a deadly encounter. And as in the other stories, the battle is preceded by a covenant meal. I dedicate a significant portion of my book to proving that the crucifixion was regarded as a military narrative by the early Christian community. I also connect specific details of the account to other narratives that feature the pre-battle banquet motif, and I highlight the centrality of the covenant to all of it. Here I just want to offer a word of encouragement to my fellow spiritual soldiers. 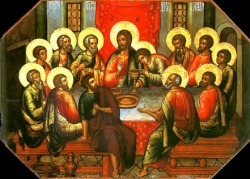 I hold the firm conviction that one of the principal reasons that Jesus gave us the Eucharist is so that His pre-battle banquet could become ours. You and I, disciples that we are, also bear our crosses towards Calvary. Whether we like it or not, we are at war with the evil one. Feeding on the covenant meal that Jesus has given us, nourished on His very Body and Blood, we are made ready for our next inevitable encounter with malevolence. Indeed, by simply receiving the Eucharist, we identify ourselves with our Messiah and His victory to defeat our enemies.